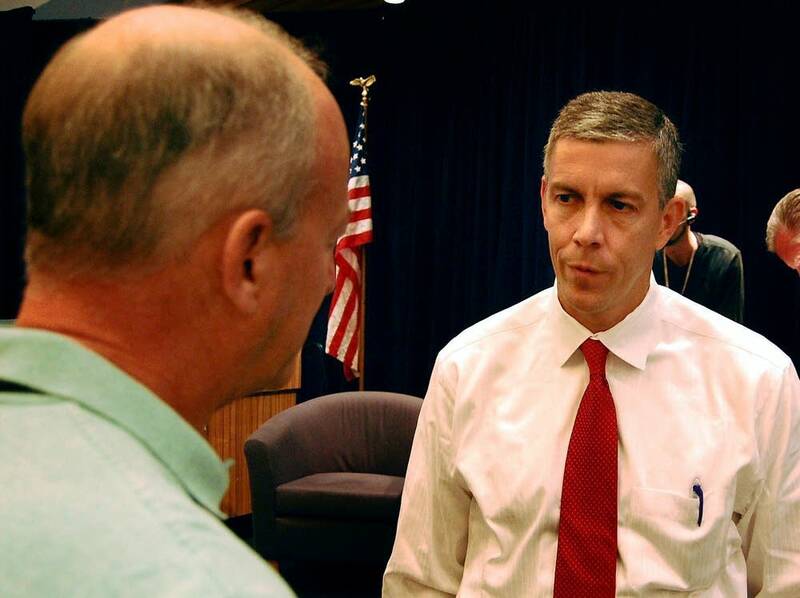 U.S. Secretary of Education Arne Duncan wants to see much more cooperation and communication between K-12 schools and colleges. Speaking before the Council of Chief State School Officers and the State Higher Education Executive Officers in Minneapolis on Friday, Duncan said the U.S. needs more college graduates to stay competitive in the world economy. Duncan said the fact that a group focused on primary and secondary education was meeting with higher education leaders was a good start. But he said there are big challenges ahead for the nation's educational system. "We have to dramatically improve the quality of education in our country ... higher high school graduation rates, greater college graduation rates, more high school seniors graduating actually prepared for college," he said. "The only way we can get there is through collaboration and working differently." For collaboration to be effective, Duncan said, high schools should be able to guarantee that a student's diploma means they're ready to take on college level work without needing remedial courses once they get to campus. He said colleges should do a better job of telling high school students exactly what will be expected when they get to campus. We have to really start much earlier, starting in about third grade, talking about the importance of college. Duncan also wants to see more rigorous training for new teachers, and said K-12 schools and colleges should better share and track data, so both can determine what approaches work best. Paul Lingenfelter, president of the higher education officers' group, said it only makes sense to have elementary schools, high schools and colleges work more closely together. He said the nation's K-12 system needs the help of higher education to succeed. Higher education can't succeed without both engaging K-12 and improving K-12 ... and also without having high school graduates come to college ready to succeed," he said. Many of the approaches Duncan called for are already being implemented in Minnesota. Both the University of Minnesota and the Minnesota State Colleges and Universities system are beginning to track student data more carefully. They hope to catch students who might be facing academic or financial trouble early on, before their problems cause them to drop out. The region is poised to undergo a transformation in how teachers are trained. The St. Paul-based Bush Foundation has promised $40 million in a 10-year effort to improve teacher preparation at more than a dozen colleges in Minnesota, North Dakota and South Dakota. Minnesota's public and private colleges also are reaching out to students as far back as middle school to get them to start thinking about college -- and what they need to do academically and financially to prepare themselves. That kind of outreach could start even sooner, according to Dave Metzen, director of the state's Office of Higher Education. "You can't do enough of it," he said. "We have to really start much earlier, starting in about third grade, talking about the importance of college." Metzen said the state does a good job of preparing high school graduates for college, but falls short when it comes to making sure those students get their diploma. Although 70 percent of Minnesota high school graduates go on to college, one in five of drop out after one year. Duncan said improving those college graduation rates, and getting more students prepared for college is one of President Obama's priorities. The president wants the United States to lead the world in the percentage of citizens who have a college degree by the year 2020.